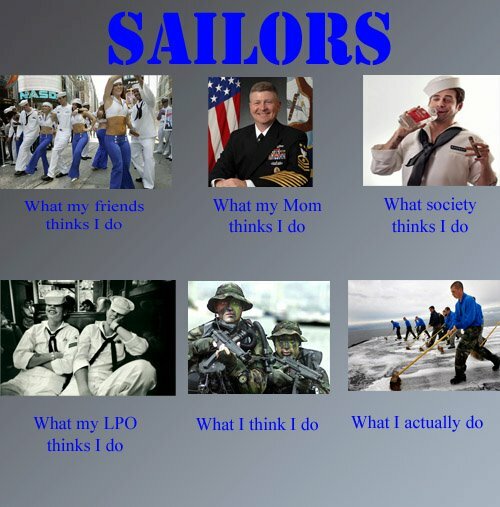 No need to feel left out: sailors now have a meme. // Courtesy of Erik Hoffmann. Doctors have one. So do karaoke singers, movie directors, librarians, pilots, journalists and disc-jockeys. Now, sailors can claim their own What-people-think-I-do meme. For the uninitiated, that’s the Navy’s top enlisted man, Master Chief Petty Officer of the Navy (SS/SW) Rick West, mugging in the top center photo. Scoop Deck thinks the rest of the 6-photo slide, designed by a sailor, speaks for itself — and with its own salt. Regarding the photo in the top left corner, I don’t think too many Americans think that Sailors dance with girls. Dancing in a Gay Pride parade might be a bit more accurate! Since DADT, not too many folks think sailors would dance with women.